The internet is a seriously amazing place when you stop and think about it. It’s hard to even remember what life was like before we had the world wide web, before smart phones, and before free public wifi. Back when you’d have to wait until you got home to look up the useless bar trivia we now have answers to at the click of a button. Way back when you had to consult actual cook books to find recipes, rather than finding pages and pages of search results for even the most obscure cuisines. I have shelves sagging with cookbooks, but most of them spend more time collecting dust than helping me cook. These days I rely on the internet to provide me with drool-worthy recipes and endless culinary inspiration. Most of the time, even when a recipe sounds mind-blowingly delicious, I like to make a few changes here and there to suit my taste. 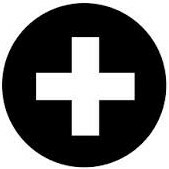 Increase this, substitute that, omit the other. You know. I’m sure you do the same, at least some of the time. 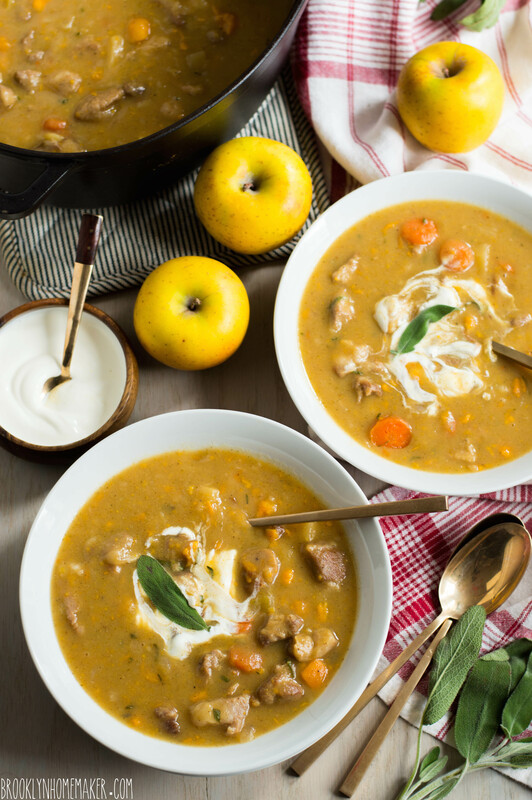 In my ceaseless internet exploration I recently stumbled across a recipe for pork and apple stew from Better Homes and Gardens that I just HAD to try. To that end, I thought I’d do something a little different today. Please head over to Better Homes and Garden’s blog, Delish Dish for the rest of this post and to find the original recipe and see the changes I made to it. This post was written in partnership with Better Homes & Gardens. Tux Loerzel and Brooklyn Homemaker were not compensated for this post. You guys. Break out the streamers and balloons. Brooklyn Homemaker turns two today! It has been exactly two years since I started this whole adventure, and I gotta say that I’m really proud of myself and my humble little blog. I think a celebration is in order. When Brooklyn Homemaker was born I had no idea how far I would come, or could come, or how much I’d learn, or grow, or how many friends I’d make, how many people’s lives I’d touch, or how many people’s lives would touch my own. Day by day, post by post, little by little; I’ve forged new relationships, met new people, tried new things, experimented with new recipes and ingredients, grown as a photographer and recipe developer, and slowly developed a dessert plate hoarding problem that’s beginning to concern my husband. I’ve also learned that while the blogging world is competitive place, it’s also a warm and welcoming place with a strong sense of community. It’s filled with genuinely lovely, charitable, supportive individuals who love to help each other out whenever and however they can. Over the past two years I’ve also learned a lot about myself and what I want for and from Brooklyn Homemaker. I’ve learned to accept that what I like and what I don’t like is more important to me than what the blogging powers-that-be tell me is important. Lately I’m trying to take a quality over quantity approach when it comes to my posting schedule, and focus on what makes me happy rather than what I’m told will get me more re-pins and likes. I gotta be me. What else can I be? When my first anniversary rolled around last year I decided to recreate the cake that started it all, the cake that launched 1,000 posts (well, 142 and counting), the incomparable Aunt Sassy cake. While this pistachio dream cake is seriously amazing, I couldn’t do it again because, well you know, been there done that. Twice. Of course the best part of these fairs and festivals is always the food! There’s the staples like fried dough, funnel cakes, and corn dogs; but upstate we have our own regional specialties like salt potatoes, chicken spiedies, and steaming cups of fresh pressed warm apple cider. When it comes to fall festival foods though, my all time favorite is and always will be sweet little apple cider doughnuts fresh and warm from the fryer, sparkling with sugar and cinnamon. As soon as those chubby little doughnuts crossed my mind I KNEW I had my idea. Now, you may think that to really translate the essence of a doughnut into cake form it should be round, like a bundt cake. 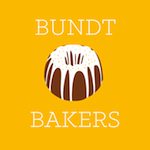 While I’d normally agree with you, I do plenty of bundt cakes around here. This occasion called for a true celebration cake. Something with layers. Something tall. I’m not usually a huge fan of naked cakes. They can feel a little too hip and trendy for me, but I guess I live in Brooklyn so I should probably just get over that. I also feel like the whole point of icing a cake is to seal it under a thick delicious layer of sugar and fat to keep it from drying out or going stale. 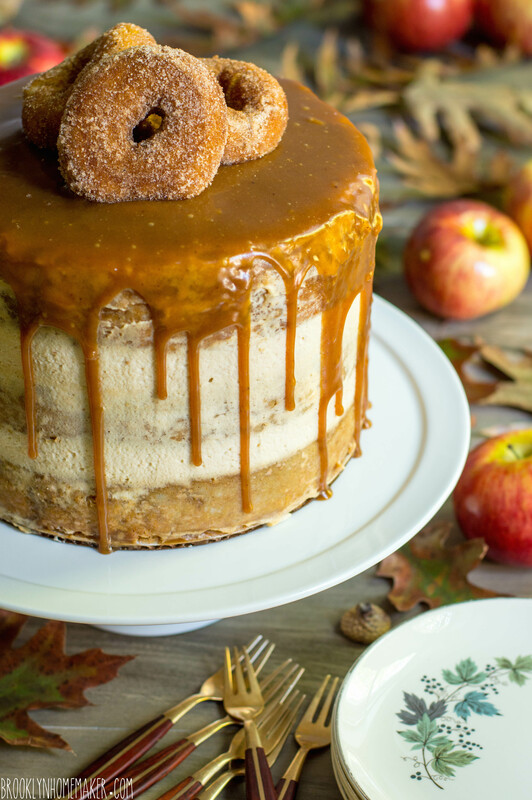 This time around though, I had this whole big bright idea to coat the cake layers in cinnamon and sugar rather than icing to really drive home the cider doughnut point. Even me. Even after two years of blogging. I was really stuck on this idea of coating the cake layers in sparkly cinnamon sugar, so I brushed each one with some melted butter and pressed the sugar into it. Then I stacked away and sandwiched a thick blanket of icing between each layer. The icing squeezed out the sides a little as I stacked, and at first looked imperfect and rustic in a charming sort of way. Once I went ahead with the caramel drizzle though, I had a disaster on my hands. 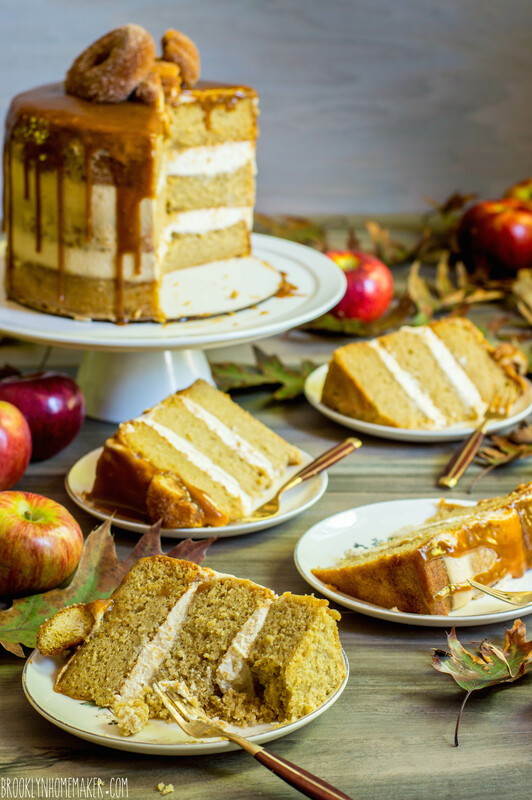 Rather than drizzling evenly and elegantly down the sides of the cake, as soon as the caramel reached the icing it pooled and dripped and ran all over the place. I did my best to control the way I drizzled and poured to get the look I wanted, but to no avail. You’ll just have to trust me when I say that it looked really terrible. Even Russell, who generally knows to bite his tongue when I’m in the kitchen, had to admit that it wasn’t my best work. I mean, it’d still taste great but it certainly wasn’t going to photograph well, and this is a special occasion! As fate would have it, Russell had friends visiting from LA and of course they rang the buzzer almost at the exact moment that I realized things weren’t going my way. I was already getting frustrated, and with guests coming through the kitchen with suitcases I started to get really embarrassed too. 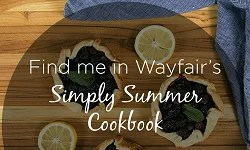 I try to project an image of domestic perfection through my blog, so when things don’t turn out perfectly I feel like it reflects poorly on me and my abilities as a baker and blogger. I was so upset and embarrassed by my cake that I actually just stood in front of it as our guests were coming in, trying to block it from view as they were getting settled. I knew I was being ridiculous, but that just made me feel even worse and I could feel my temper getting away from me. Rather than risk a blowout in front of people I barely knew, I put the cake in the fridge for a few minutes and went to sit and chat with our guests. Once I’d calmed down a little I felt brave enough to take the cake back out of the fridge and see what I could do with it. Luckily I had a bit of icing and caramel left over, so I scraped the mess off the sides and set to work with an icing spatula. 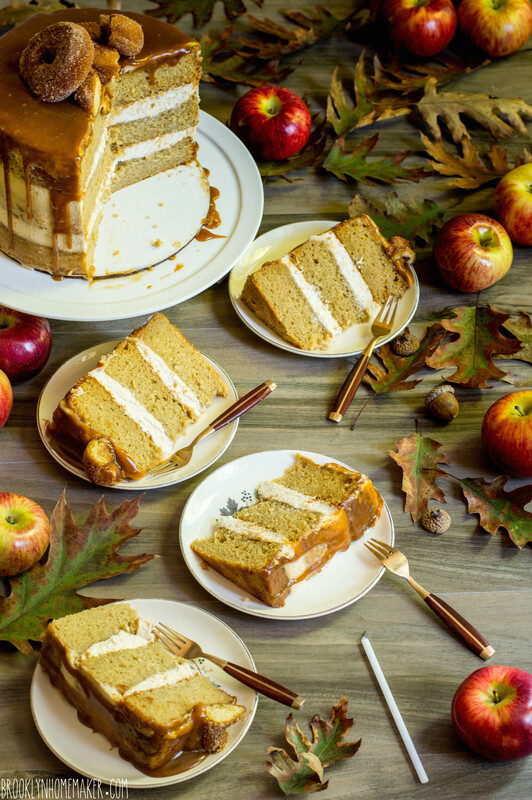 Once the sides were nice and smooth, the caramel poured down the cake like a dream! Phew! Crisis (and tantrum) averted. This cake. Oh boy. This cake. This cake is out of control. It’s a true celebration cake in every sense. 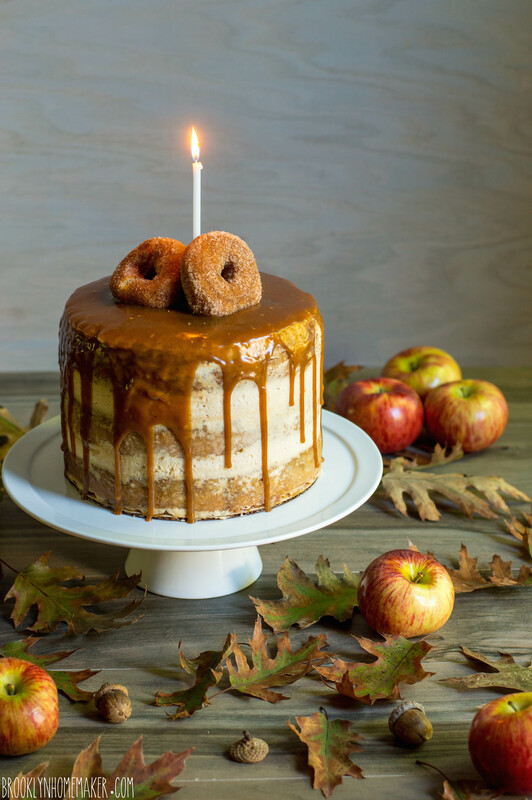 The cake itself is unbelievably moist and tender and springy, just like a fresh apple cider doughnut. 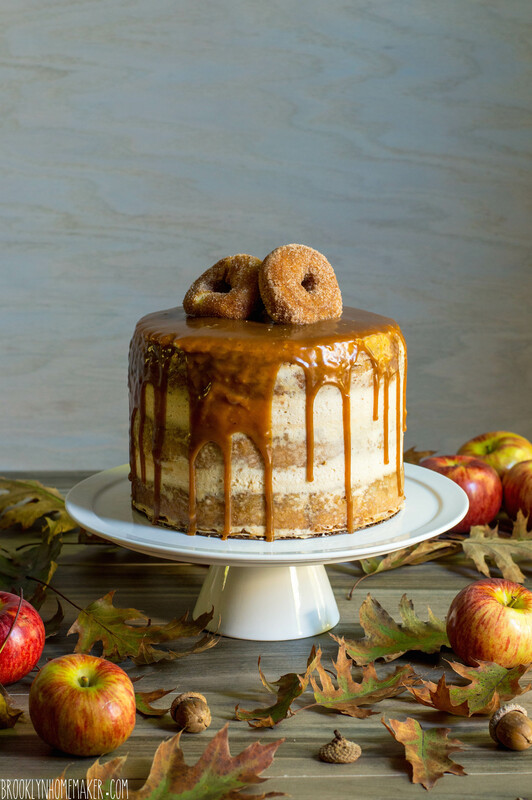 It’s rich, subtly spiced, and just sweet enough; and just like an apple cider doughnut it has a delicate yet distinct apple-y flavor. Then of course, there’s the caramel sauce. I don’t have words for just how good this stuff is. It’s insane, like eating a caramel apple, in sweet buttery sauce form. It’s made by reducing and reducing and reducing apple cider until thick and syrupy; then adding butter, cream, brown sugar, a bit of spice, and a touch of salt. I should have guessed this, but with this sauce the lost cinnamon sugar coating wasn’t even missed. 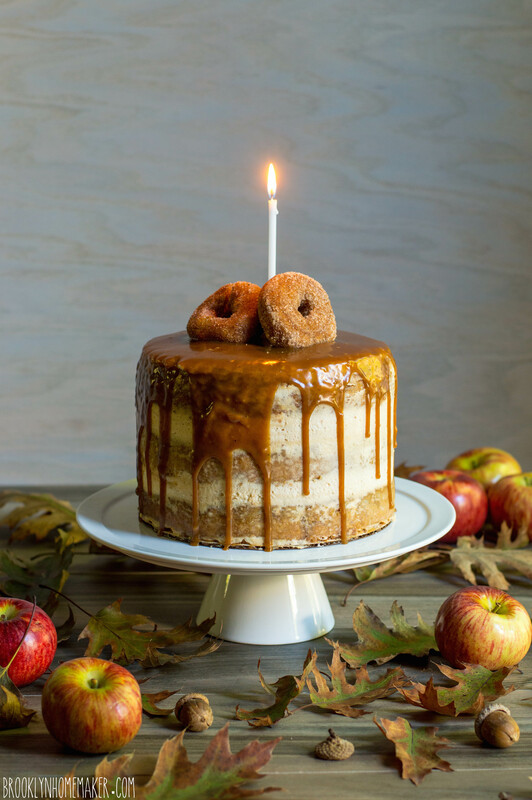 The sugary chubby little doughnuts on top aren’t absolutely necessary, but they sure are cute, and I really think they make this cake sing. I couldn’t have asked for a better cake to celebrate my second anniversary. Here’s to many more to come, and here’s to you guys! Thanks for reading, and commenting, and thanks for coming along for the ride! Adjust oven rack to middle position and preheat oven to 350°F. Brush the bottoms of 3 eight inch cake pans with butter. Place 8″ circles of parchment in the pans, and generously brush pans all over with butter and coat with flour, tapping out any excess. 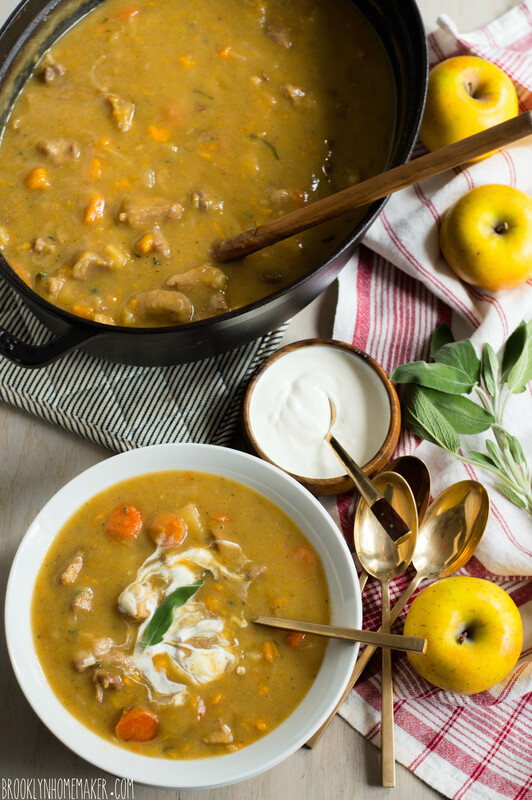 In medium saucepan, bring chopped apple and cider to boil over medium-high heat. As apple begins to fall apart, stir and whisk with a fork to try to mash and break it up as much as possible. Reduce heat slightly and simmer and reduce, stirring frequently, until mixture measures exactly 1 1/2 cups, about 20 minutes or so. Cool at least 5 minutes in a large measuring cup before mixing in buttermilk and vanilla. Set aside. In medium bowl, whisk together flour, baking powder, baking soda, salt, nutmeg, and cinnamon; set aside. In the bowl of an electric mixer, beat the butter, sugar, and brown sugar on medium speed until light and fluffy, about 3 minutes. Add eggs, one at a time, beating well after each addition. Add oil and beat until incorporated, about 1 minute. Decrease mixer speed to low and add flour mixture in three batches, alternating with apple mixture, scraping down sides and bottom of bowl with rubber spatula as needed. Increase speed to medium and beat mixture just until combined, about 30 seconds. Evenly divide batter between prepared pans. Bake until cake tester inserted in cake comes out clean, rotating cakes halfway through baking, about 30 to 40 minutes. Transfer cakes to cooling rack for about 20 or 30 minutes, before carefully removing the cakes from the pans to cool the rest of the way. Cool completely, about 1 hour, before assembly. Just before assembly, remove parchment if still stuck to the cakes. Place apple cider in a medium heavy-bottomed pot. Bring to a boil, reduce to a high simmer, and cook until cider is reduced to ¼ cup. It should get a bit thick and syrupy. The thicker it gets the closer you need to watch it to be sure it doesn’t dry out or burn. Add butter to the pan and heat until melted. Add the sugar, cream, salt and spices and whisk to combine. Bring to a gentle boil and cook for 7 minutes, stirring frequently. Remove from heat and add vanilla extract, stirring to combine. Mixture will thicken as it cools. You’ll likely have more sauce than you need for this cake. Any extra should be kept in the refrigerator to be eaten with a spoon at midnight. In the bowl of an electric mixer fitted with the whisk attachment, whip the heavy cream until it begins to thicken and form soft peaks. In a separate bowl, stir together the mascarpone, sugar, vanilla, spices, and salt until smooth and well combined. Transfer mascarpone mixture to bowl with thickened cream and beat on low speed until almost smooth, 30 to 60 seconds. Scrape down the sides and fold to incorporate. Increase the speed to medium high and beat until the mixture is thick and holds firm peaks, another 30 to 60 seconds. Do NOT overbeat or the frosting will become grainy. 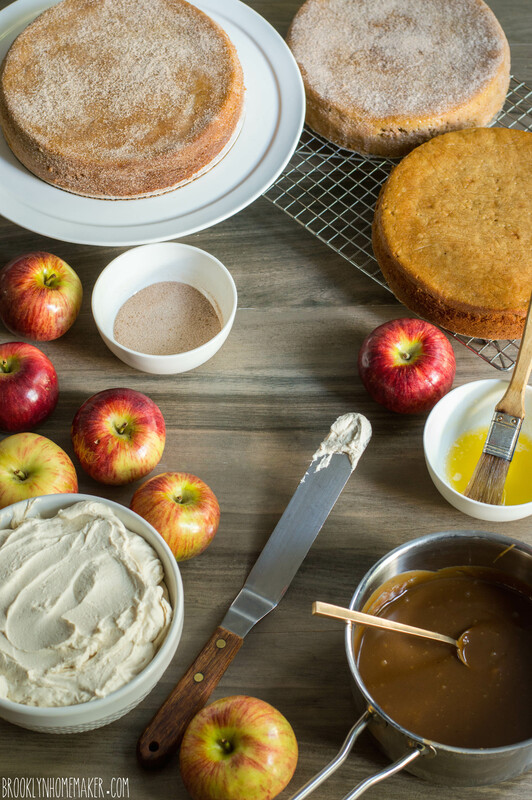 Place the first cake layer on an 8″ cardboard cake round, serving plate, or cake stand. If necessary, trim the top with a cake leveler or sharp serrated knife to create a flat surface. Top with about 1/3 of the mascarpone cream icing and evenly smooth out with an icing spatula. Add the next layer, trim and ice with the same amount of icing, then add the third layer and trim flat as necessary. Top the third layer with about half of the remaining icing, and smooth it out as flat as possible. Spread the remaining icing in a very thin smooth layer over the sides of the cake, and put it in the refrigerator to firm up for about 30 minutes. Top the cake with about 3/4 to 1 cup of the cooled caramel sauce, carefully and evenly drizzling some down the sides. 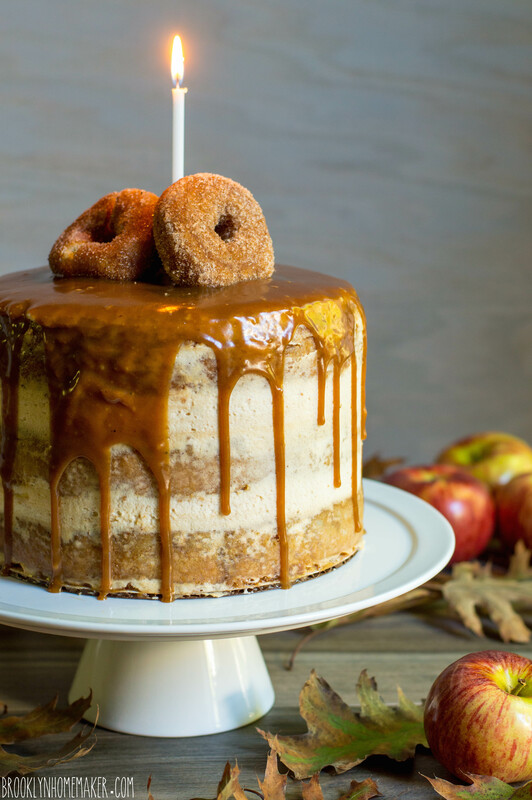 If desired, top the finished cake with 3 small fresh apple cider doughnuts. This cake will keep well in a cake saver at room temperature for up to 3 days, if the weather is not too hot or humid. 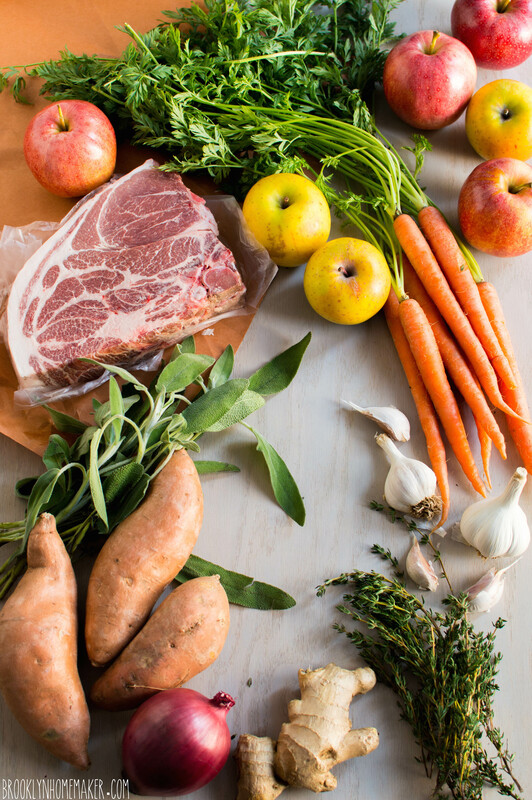 Otherwise, wrap tightly and store in the refrigerator for up to 3 days. Bring to room temperature for at least an hour before serving. Thanksgiving has come and gone, and now it’s officially December. I really can’t believe how quickly this year has gone by. The idea that we’re now in December is completely bewildering to me, but here were are. Early December always puts me in the mood to do two things. and 2) Bake holiday cookies!!!! I know Christmas is still a few weeks away yet, but I’ve got cookies on the mind nonetheless. Holiday parties and cookie swaps usually start well before Christmas day, so it seems that the day the calendar flips over to December, holiday cookies are fair game. I’m not here today to share a holiday cookie recipe though. I’ve been thinking about my baby dogs a lot lately, and how they deserve to benefit from all my holiday cookie baking too. I make their wet food every month and freeze it, so they’re totally spoiled, and they do get a lot of treats in the way of fresh apples and sweet potatoes, but I’ve actually never gone to the trouble to make any homemade cookies just for them. 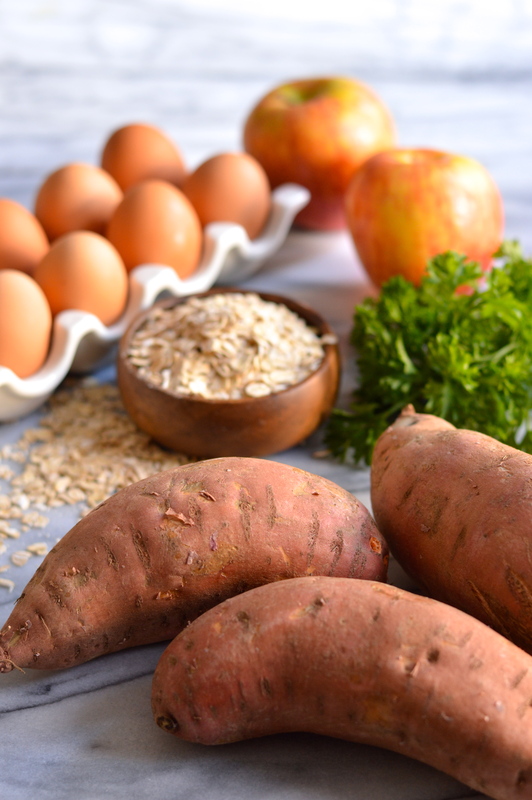 Given their fondness for apples and sweet potatoes, I decided to combine those flavors with a bit of parsley (for breath freshening) and some oats and brown rice flour for substance. I bought this teeny tiny dog bone cookie cutter from work over a year ago so I’m thrilled to finally have a reason to use it! How freaking cute are these little treats?!?!?! 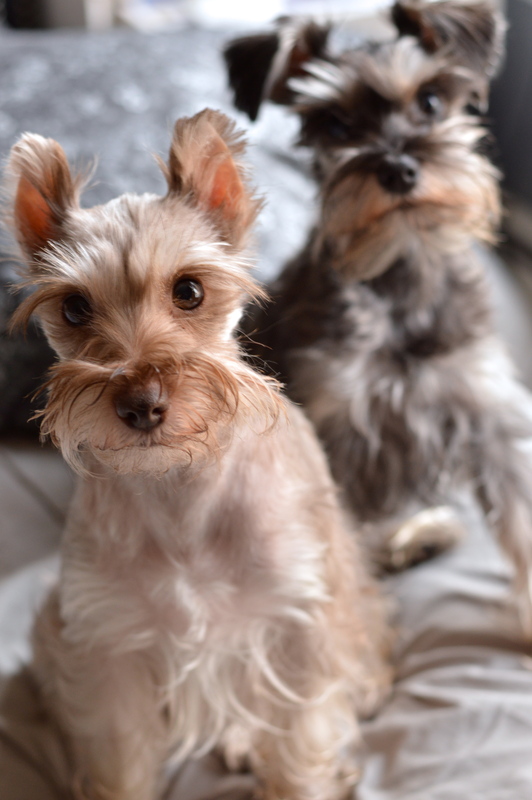 I’ve also realized recently that I haven’t been sharing many photos of the pups here lately. If you follow me on instagram, you see plenty of them, but considering what a big part of my world they are, it’s actually pretty weird that you don’t see more of them in my posts. Today I’ll be sharing enough photos of my little girls to make up for leaving them out for so long. I mean look at those little faces. Couldn’t you just die? Doris, the grey one on the left, was our first. She came home with Russell less than a week after we were engaged, and it was love at first sight. He took our engagement as a sign that it was time to start a little family, and I’m so glad that he did. She’s the sweetest, cutest, most calm, loving, & loyal little pup you could ever want. She also tends to be the stubborn one, but I’m pretty sure she gets that from me. Betty, on the right above, was actually a wedding gift to us from Russell’s sister and her family. At our wedding she gave us and IOU for a new puppy, and shortly after we came back from our honeymoon she rescued a little puppy that needed a new home. Russell’s family is from California, so his sister fostered her for us for almost a month before we were able to fly out and get her. 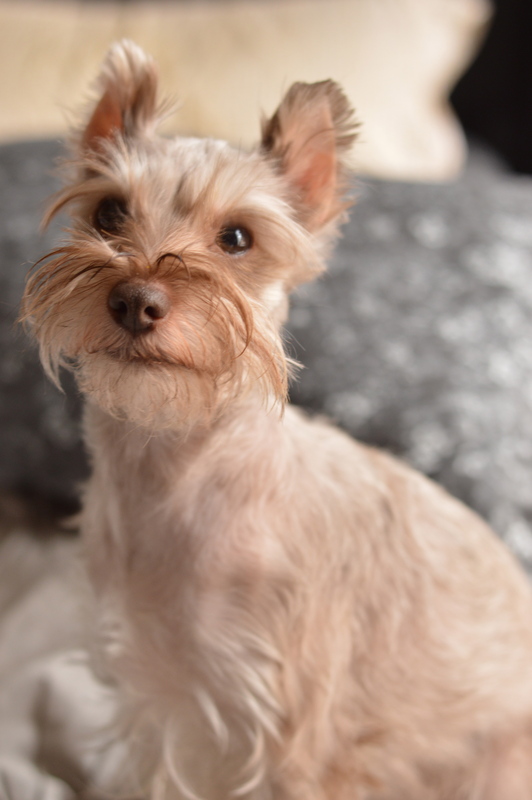 Betty is the playful, scrappy, protective one in the family. She’s intensely concerned with what’s going on in our backyard and cannot allow even the tiniest bird to land in our yard without letting them know that they’re on her turf. Considering they’re both the same breed, it’s shocking to me how different their personalities are. 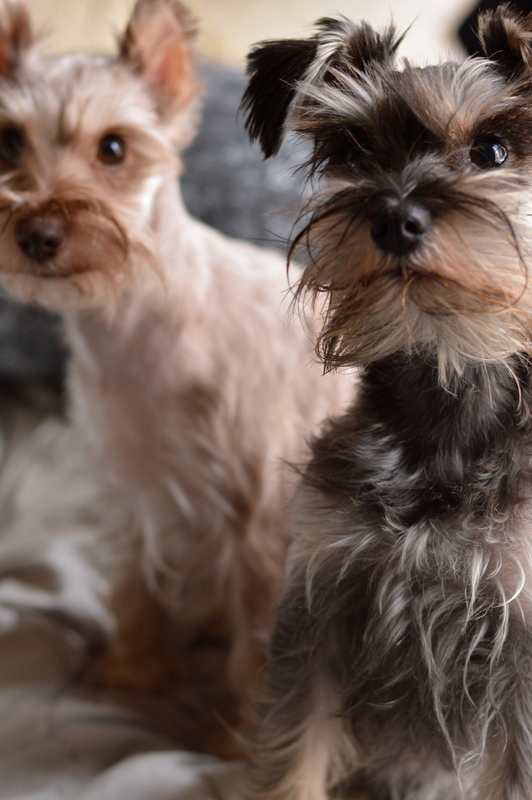 Doris and Betty are miniature schnauzers, a breed we fell in love with after doing a lot of dog sitting for friends. They’re both really small for their breed though, and we’re not sure how or why they both worked out to be the same super tiny size. 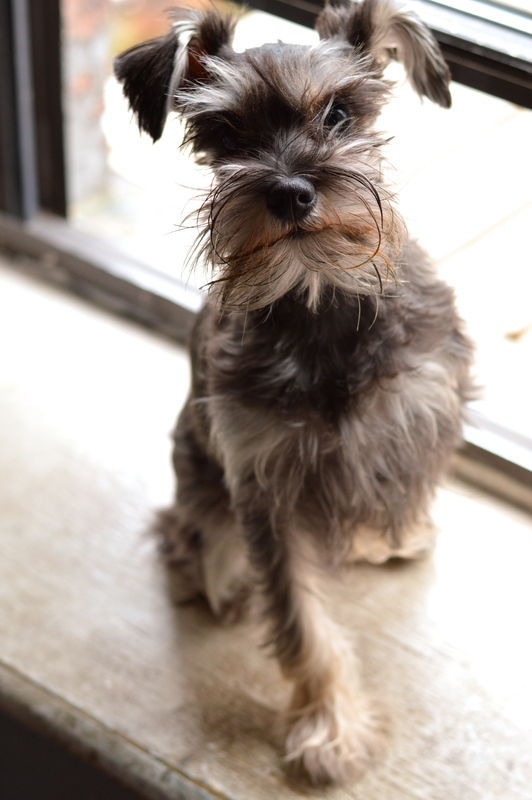 The average miniature schnauzer is usually about 15 or 20 pounds, but Doris is 7 pounds, and Betty is 6. 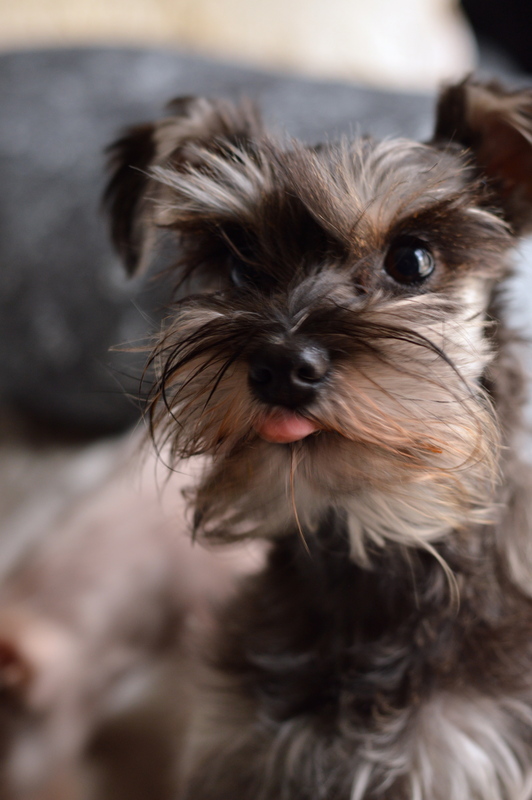 I think that Doris may have been the runt of her litter, and while Betty has AKC papers as a pure bred miniature schnauzer, I am pretty sure she was intentionally bred to be a tea-cup or toy size. Despite their tiny size, these girls have BIG personalities, and bring a ton of joy into our lives. I hope that seeing all these pictures of someone else’s dogs, that you’ve never met, hasn’t caused too much eye rolling. They’re a major part of my life, so you’re just going to have to grin and bear it. Hopefully though, you’re enjoying every second of it. 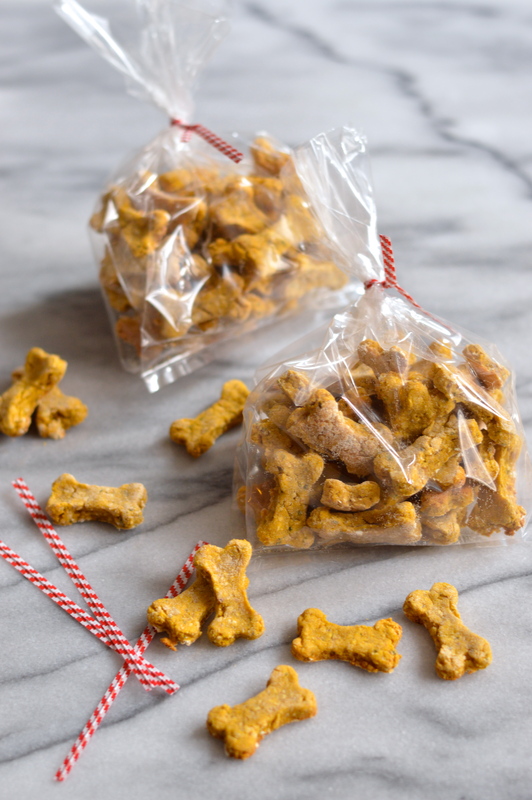 If you have a dog at home that deserves just as much love and special treatment as my little girls do, these treats are sure to please. I tried them myself, because I’m weird like that, and by people standards they’re a little bland, but Doris and Betty LOVE them. They love sweet potato and apples already though, so if your dogs don’t I can’t guarantee the same results. If baked until completely dry and crisp, these treats should keep for a month or more in an airtight container. They’ll make perfectly adorable holiday gifts and stocking stuffers, so if you’re as crazy about what you feed your dog(s) as I am, these are a great gift idea! 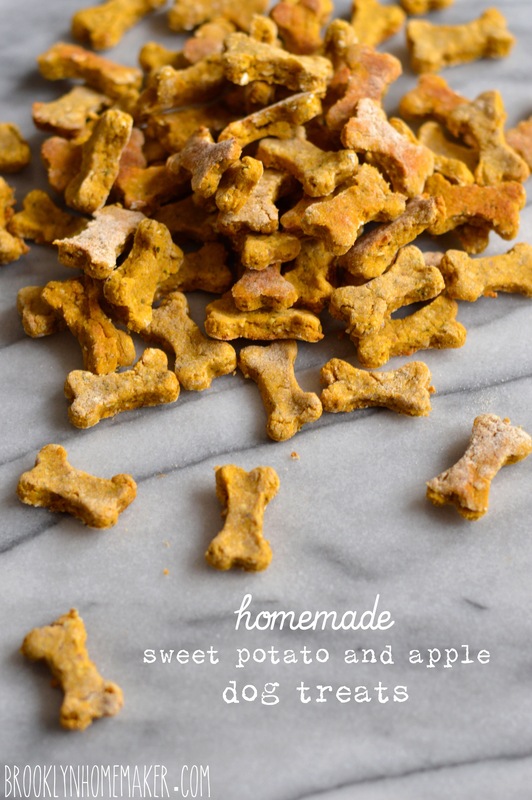 I used a tiny (1 inch) dog bone cutter and got over 150 treats out of the recipe, but I have tiny dogs so a little goes a long way. 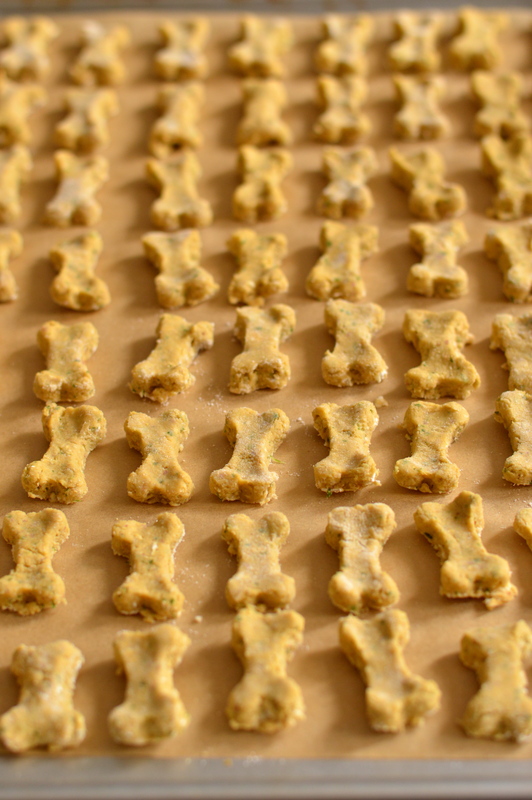 If you have a bigger dog and use a larger cutter you’ll get a lot less out of your batch. Preheat your oven to 400F. Slice the tips off the ends of your sweet potato, and cut the potato into 4 quarters (leaving the skin on). 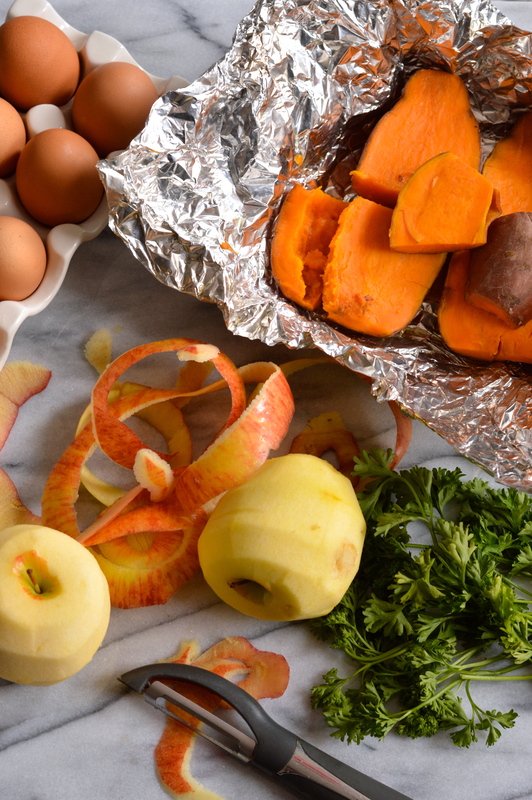 Wrap the sweet potato in aluminum foil and roast on a baking sheet for about 45 minutes or until cooked through and tender. Let cool a bit before handling. Reduce oven to 350F. Puree the cooled sweet potato in the bowl of a food processor. You want about 1 cup of puree. Peel and core the apple and process, along with the parsley, until finely chopped and well combined. Pulse in the egg and pinch of salt to combine. Add the brown rice flour a oats and pulse pulse pulse until the dough comes together in a sticky ball. 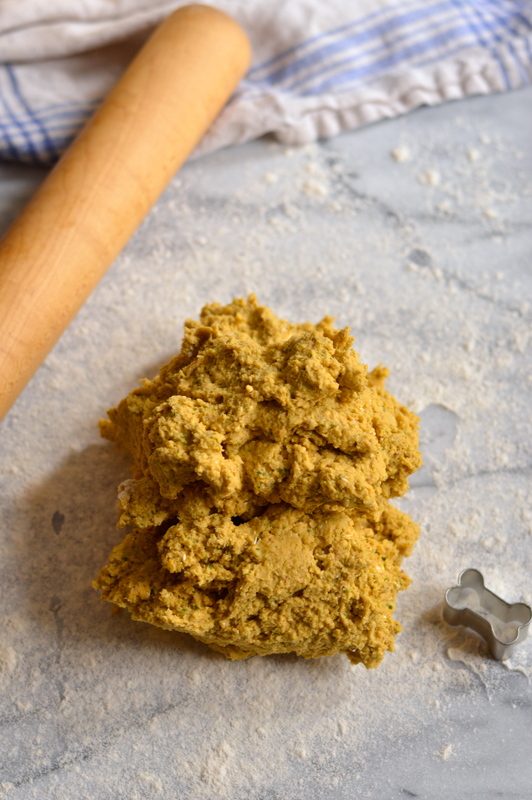 Roll out to about 1/4″ thickness on a well floured (using more brown rice flour, not wheat flour) surface, with plenty of rice flour on the rolling pin and your hands. The dough will be sticky but workable. You may want to keep a little bowl of the rice flour to the side to dip your cookie cutter in every now and again. Cut out with desired cookie cutter in any shape or size you like. 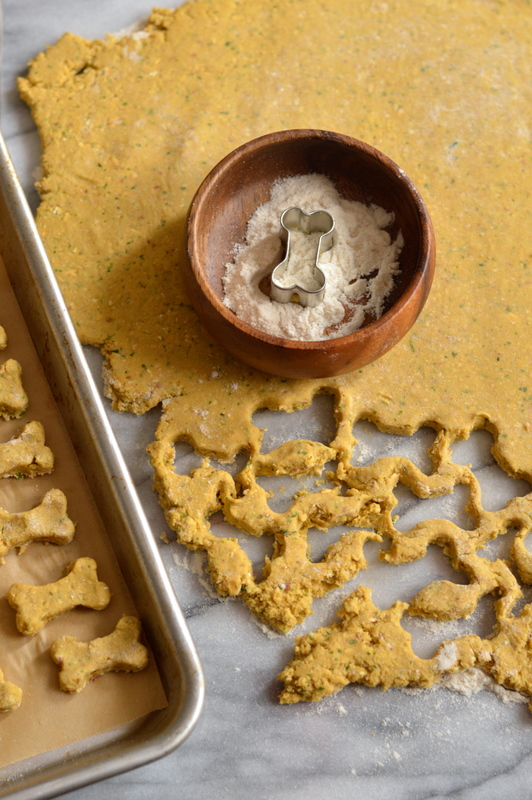 The smaller the cutter, the more treats you’ll get out of this recipe. Line up the treats on 2 parchment lined baking sheets. They can be spaced pretty close together (but not touching) as they won’t spread much (if at all). Bake at 350F for about 20 or 30 minutes, or until completely dry and crisp. Larger shapes may take longer to bake. If you’re going to try to keep them for more than a few days though, it really is important that they’re completely dried out. Store for up to a month in a cool, dry place, in an air-tight container.